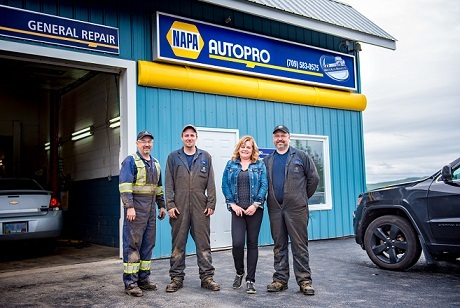 Michael and Teena Piercey started their own auto repair company in Winterton in 2006 and they became incorporated as Mike’s Auto Repair Inc. in 2007. They received support from the province to purchase the building and land on which the business operates and also to purchase a tow truck. Mike is a Journeyman mechanic and provides all types of repairs and maintenance services for all types of vehicles – private and commercial. Teena handles all administrative and human resource matters related to the company. They are the only auto repair shop offering wheel alignments in the area and provides towing services. In 2011, Mike and Teena wanted to make changes to their building to accommodate commercial vehicles. This included installing a commercial garage door and increasing the height of a portion of the building. They approached CBDC Trinity Conception with this idea and received financing. Mike and Teena employ 4 full-time people including themselves. Since 2008, Mike’s Auto Repair has experienced an 84% increase in sales and more than 400% increase in net income. CBDC Trinity Conception is happy to be working with Mike and Teena Piercey and we wish them every success as they continue to operate and grow Mike’s Auto Repair Inc.